The whirlwind of festivities that is Emerald City Comicon wrapped up after three sold-out days – March 27-29, 2015 – at the Washington State Convention Center. From the Marvel Cinematic Universe to the Whedonverse, from Star Wars to Star Trek, there were a ton of highlights during the celebrity guest panels – most of which were tested the capacity limits of the main hall. 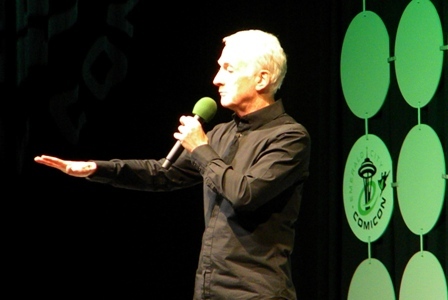 We’re going to spotlight a few of our favorites, starting with C-3PO himself, Anthony Daniels. 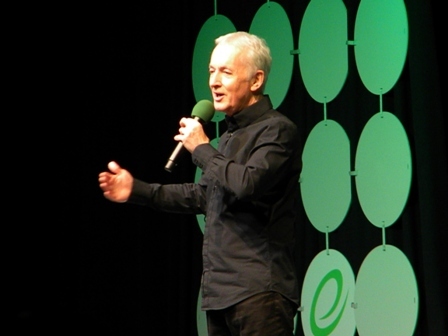 Anthony Daniels kicked off Saturday, day two of the con, with a packed house. After moderator Grant Imahara (former MythBusters host and ILM special effects tech, with credits on multiple Star Wars films to his own name) introduced Daniels, we were treated to a short video montage of C-3PO’s greatest moments. Clearly everyone in the 3,000-plus, standing room-only audience was hanging on Daniels’ every word for any tidbit about the upcoming episode seven, Star Wars: The Force Awakens. We didn’t hear much in the way of specifics, but he did ask the audience what director J.J. Abrams has brought back to the Star Wars universe with the episode seven. After numerous guesses yelled out by various audience members (“Harrison Ford!” etc), Daniels summed up it up with one word: “Scenery.” As in, practical shooting locations instead of the green screen, CG-dominated artificiality (my word choice there) of the prequel trilogy. He also praised Abrams as a collaborative director, but stopped short of making any direct comparisons to the methods employed by George Lucas. When someone in the Q&A line mentioned midi-chlorians, Daniels visibly tensed up and admitted to being nervous anytime someone brought up that prequel-only addition to Star Wars mythology. 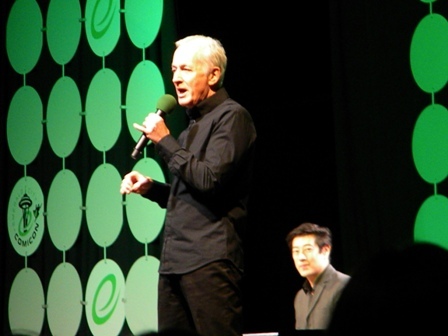 Imahara suggested the concept effectively removed the magic from the force, to which Daniels enthusiastically agreed. A very spry 69 year old, Daniels literally went into the audience at one point to field audience questions directly. He even brought a young fan onstage after the kid demonstrated how he imagined Daniels must be required to walk while wearing the C-3P0 costume. Alas, the youngster clammed up while onstage but still looked like was thrilled to be sharing a stage with one of the only actors to appear in every Star Wars film (so far). Daniels demonstrated the difference between the short-stepped shuffle he actually does while playing the protocol droid versus the lumbering lurch many people expect. As a special treat for Star Wars fans of all ages, everyone’s favorite astromech droid rolled out for a cameo appearance. No, Kenny Baker wasn’t inside it – but this was a very convincing, full-scale R2-D2 with sound effects and everything. Daniels had some fun interacting with the robot, even speaking at time “in character” using his C-3P0 affectation. 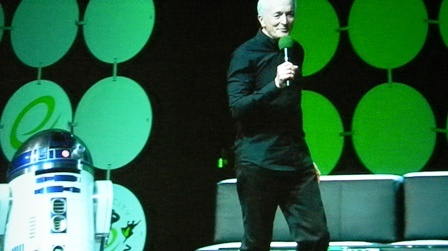 In short, if you ever have a chance to catch an Anthony Daniels convention panel – do not pass it up. Mr. Daniels was definitely one of the rock stars of Emerald City Comicon 2015!